Boy, it's been a LONG time! It's hard to imagine now how I found the time to blog nearly every day as I did a few years ago. I guess priorities just change, although I don't feel like my everyday life has changed greatly. These days, I'm on Facebook more although I don't post very much--if anything, I might comment now and then. After the recent presidential election, I was pretty disgusted with all the Facebook posts that were coming into my feed, so I stopped following a few people and joined several wool and applique groups, so my feed is a happier place to be now. For now, I've buried my head in the sand. Hubby and I just got back from a trip to the Portland area to visit the Wild Child, her husband (as of this past July), and their child, Roman. 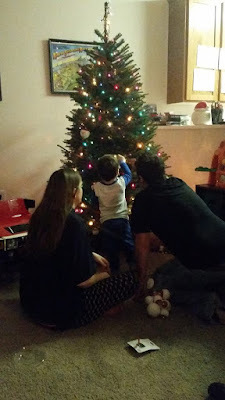 We went up there about a week after Thanksgiving and were there to help put up their Christmas tree. At each step of the decorating, Roman would stand back and whisper "Wow!" He's just a little over two years old now, so this will be an exciting Christmas for him. 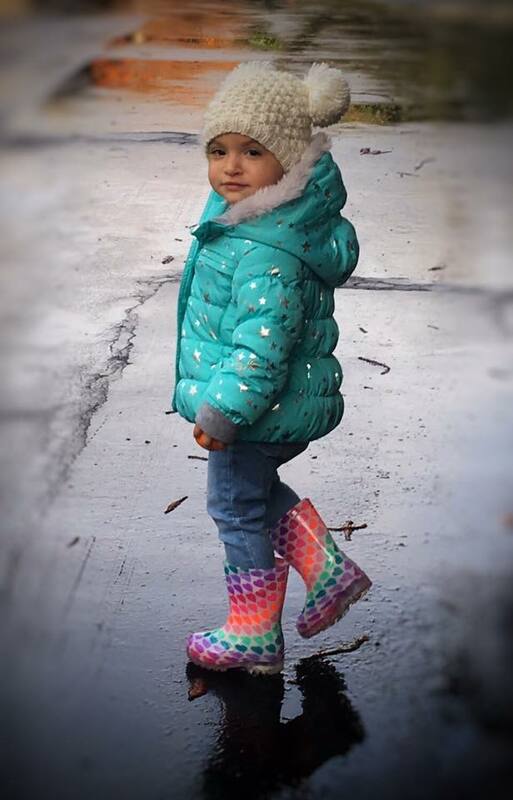 Little Mia, Soccer Son's daughter, will be two in January. 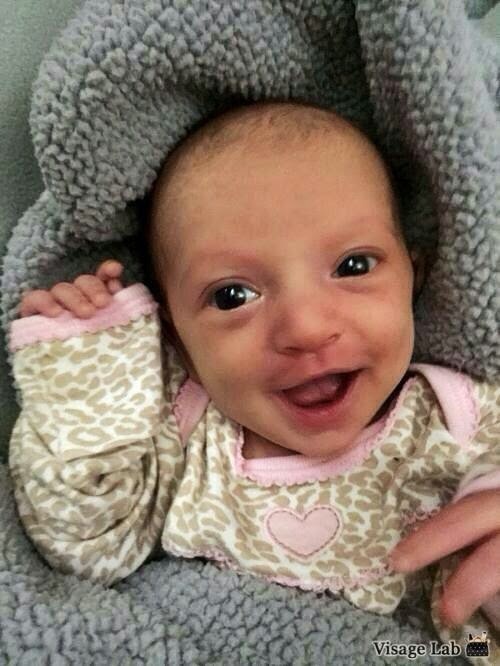 She's a real cutie too, but then what grandmother doesn't think her grandkids are cute? Soccer Son's pretty good with photography too! Isn't that a great photo? While I was up in the Portland area, I was able to attend Hollyhill Quilt Shoppe's Homespun and Holly event--a full day spent with five designers including Stacy West of Buttermilk Basin, Kathy Cardiff of the Cottage at Cardiff Farms, Sherri Falls of This and That Pattern Company, Brenda Riddle of Acorn Quilt and Gift, and Debbie Busby of Wooden Spool Designs. All of the designers were great and they had some really cute projects for us to work on. Now I'm on my way to Trader Joe's to get the ingredients to make my grandmother's applesauce cake--a Christmas tradition. 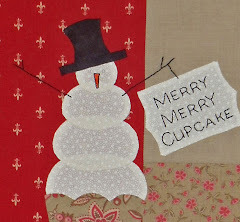 And that's why I decided to pop in and say "Hi" to all of my blog buddies--the easiest place to find my recipe is here. See? Some things just don't change. I hope you and yours have a very merry holiday season! Friday was a work holiday, so after some quality sleeping-in time, I got my house cleaned and my other "chores" done--now I have the rest of the holiday weekend to look forward to. 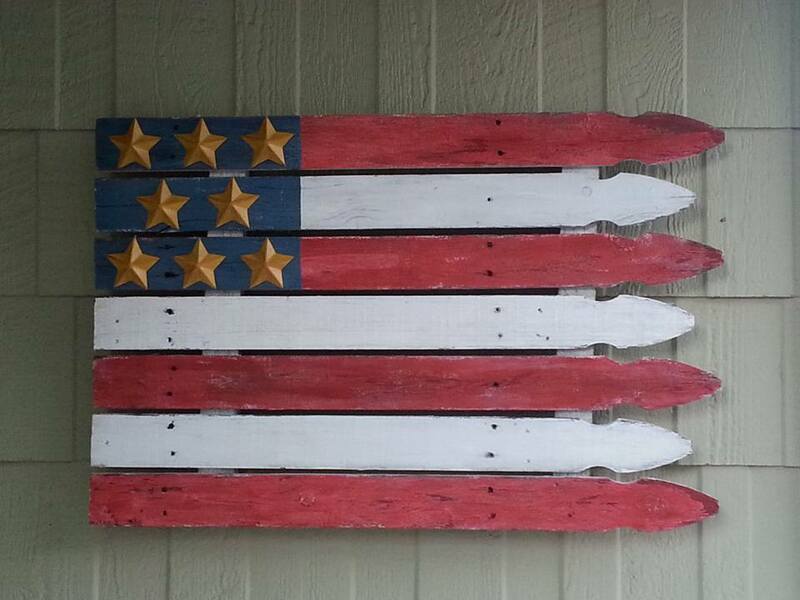 We're going to some friends' house for a 4th of July barbecue, swimming, and fireworks. I'm bringing dessert. Want to see what it is? 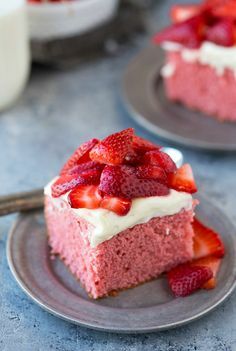 Strawberries and cream cake. This isn't MY photo, but I hope mine turns out looking just as good! I'm adding blueberries along with the strawberries on top. The cake was baked and cooled last night. Now I just need to get off the computer and make the frosting. I hope you have a fun-filled holiday! Getting Into Summer . . . It's been super hot here in Sacramento this past week--over 100 degrees a couple days and not much cooling down at night. But I think we've settled back to the norm for this time of the year, which means temperatures in the 90s during the day but cooling off a bit with the Delta breeze at night (the breeze comes up the delta from the San Francisco Bay and along the rivers that lead to Sacramento). And wouldn't you know it? Just when we're at our hottest, golf's U.S. Senior Open tournament comes to town--welcome golfers! I haven't been following it, but I gather the final round was today, so I guess the Goodyear Blimp will fly away now. I just feel sorry for the golfers and spectators who had to endure this heat wave. Hubby's 60th birthday is tomorrow, and we're having a family party at a friend's house. I'm bringing the side dishes, so at least part of the weekend was spent at the Farmers' Market, grocery stores, and my own little kitchen. I have a batch of beans going in the crockpot in the morning before work, and I'll bake up a pan of cornbread, but otherwise I'm ready. On the quilting front, I've been slowly quilting a chicken quilt. I made the quilt top several years ago from, if I remember correctly, a Buggy Barn pattern--it's one of those quilts where you stack up the fat quarters, cut, and then swap pieces around. I made this one using red, black, yellow, and cream, and while I really like it a lot, I'm just not sure where a chicken quilt belongs in my home, so I've delayed quilting it. But I'm sure I'll find a place for it. 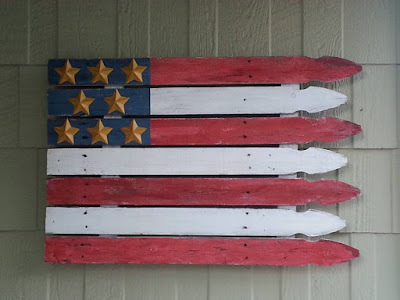 I'm kind of thinking it's summery looking, so maybe I'll hang it in my entryway after the 4th of July quilt comes down--assuming I get it done by then, of course. I've seen a version posted online where the quilter didn't do the appliqued border (just used a nice striped fabric) and I think it's almost as pretty, but we'll see how it goes once I get to that point. I just love Blackbird Designs books, but for some reason, I don't seem to buy them when they first come out; it's always AFTER they're out of print that I find I need them. I remember when Women of Grace and Charm came out, I looked at it and thought about getting it but didn't; now it's not really available anymore unless you want to pay a small fortune, and I don't, but maybe I'll come across it someday, somewhere. I took time out from food shopping and cooking tpday to make a quick trip to a vintage/antique faire, of sorts. There weren't too many vendors but the event was put on by an antique-mall type of shop that I hadn't been in before, so between one thing and another, I came home with a couple of finds. Outside in the back of the store, I found a beautiful blue casserole dish made by Halls for Montgomery Wards--I've admired them for some time but I hadn't come across one in my price range until now. I also found two "project" pieces--an old decorative wooden two shelf unit - the kind that used to be found in bathrooms or other small spaces - and a long glass-fronted cabinet door. Yes, just the door. No idea what I'll do with it, but it has promise. I think I'll probably chalk paint the shelf. It still has the key, and the inside looks almost like new, with an adjustable mirror and a plastic tray that sits in the top part. Perfect for a sewing case, right? And just $15. I didn't even try to negotiate a lower price! 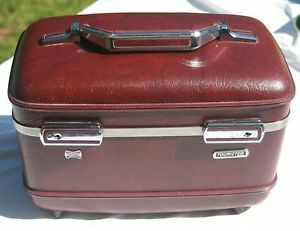 If you look at my Pinterest board called "Train/Cosmetic Case Wizardry" you'll see I've been "collecting" ideas. 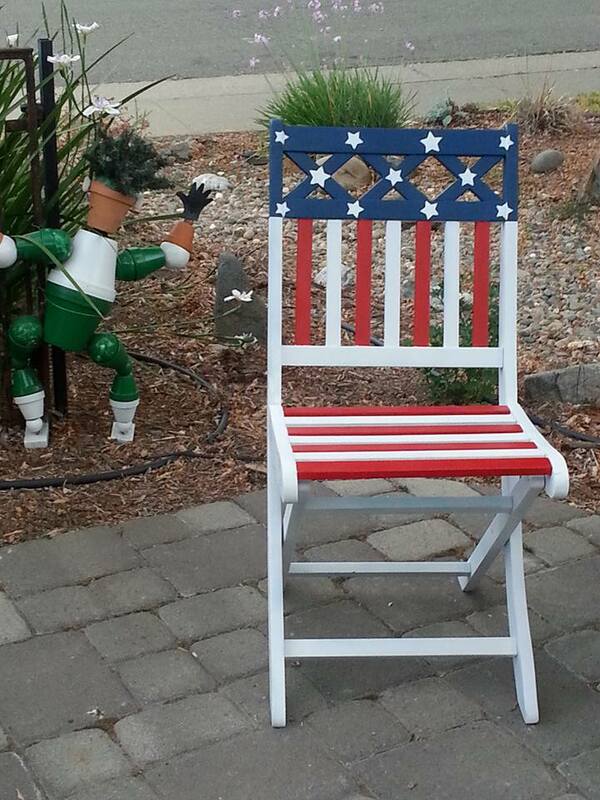 I hope you've had a good week and are looking forward to a happy 4th of July. I'll be back again . . . hopefully soon! 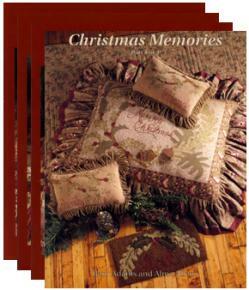 I'm looking for this set of four booklets by Blackbird Designs called Christmas Memories to buy or borrow--it takes all four to make the quilt. Please email me if you know where I can find them. Thanks! I was reading a blog the other day--actually I was looking at something on Pinterest and linked over to a blog to see how the woman had repurposed something--and I wondered what she had done more recently. Nothing, it seems. Her last post was MONTHS ago, and that post came out of the blue after another absence of months. And I wondered whether something terrible had happened to her. And then I thought about the fact that I hadn't posted anything FOREVER either. It occurred to me that there are some of you who are wondering whether I've had a devastating illness or death even. Nope! Just lazy. Or busy. Or something. It's funny how our priorities change over time. I'm still working out, dieting, and trying to lose weight. I stopped doing CrossFit in December because our "class" had dwindled down to two and I didn't feel our trainer was all that interested anymore. I tried another program in January called Kaia Fit--it's similar to CrossFit or boot camp but it's just for women--and I strained my Achilles on the third evening. So I had to wear a walking boot for seven weeks. Between the holidays and lack of exercise, I found by spring I had gained a little bit of the weight back, so I started exercising on my own, at home, around April, and I got back to really watching what I eat, so I think I'm about where I was last year at this time. My Achilles still hurts a bit and I have shoulder problems, so I'm not sure a gym workout is right for me anymore. I've purchased a FitBit to track my activity and I log my food on My Fitness Pal--I think both are excellent tools for anyone out there trying to do what I'm doing. There are apps for my smart phone too. Speaking of which, I was probably the last person in the world to get a cell phone. I hate being on the phone and I didn't really feel I needed one. When the Wild Child was pregnant, she thought it might be important to get in touch with me at some point, so she bought me a used cell phone and added me to her plan. That phone was okay for emergencies, but it was damaged and didn't hold a charge, so she recently upgraded to a new phone and passed on her older phone to me--and it works great. I still don't like to talk on the phone, but I DO like to message. A few weeks ago, Hubby and I traveled to Portland (where the Wild Child, significant other, and my grandson now live) and being able to use a GPS/map program made a big difference in traveling. So I've finally been dragged kicking and screaming into the current century, and I've found it's not so bad after all. That also brings me to Facebook. For years I didn't "do" Facebook because I didn't think quick "snips" or brief comments on life were very meaningful--not like writing and reading blogs. I still believe that but I finally succumbed and started a Facebook page. I don't write a whole lot on it though but now and then I post something. You know: quick "snips" and brief comments. If you'd like to "friend" me to make sure I'm still alive, leave me a comment here and I'll add you to my friends list--be sure to give me your full name or link to your Facebook page so I can find you. 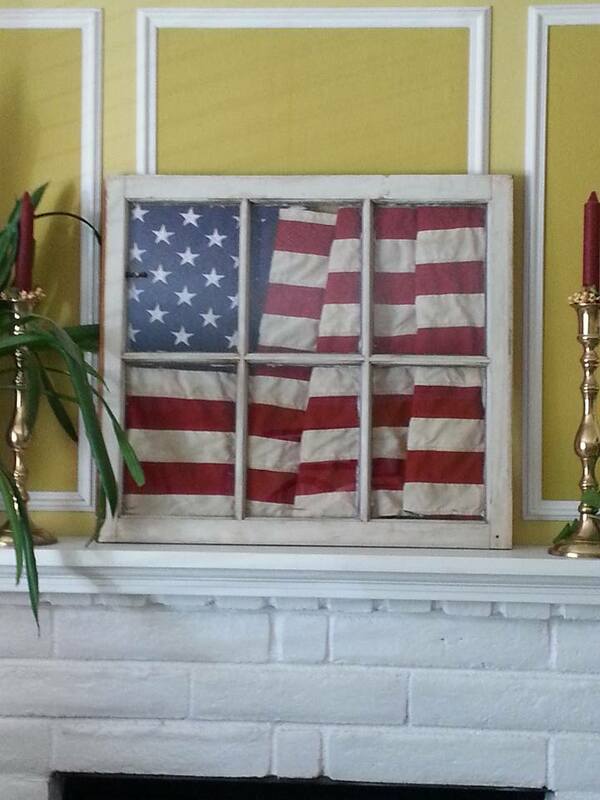 When Hubby and I were in Portland, we visited Hippo Hardware and I brought home an old window. 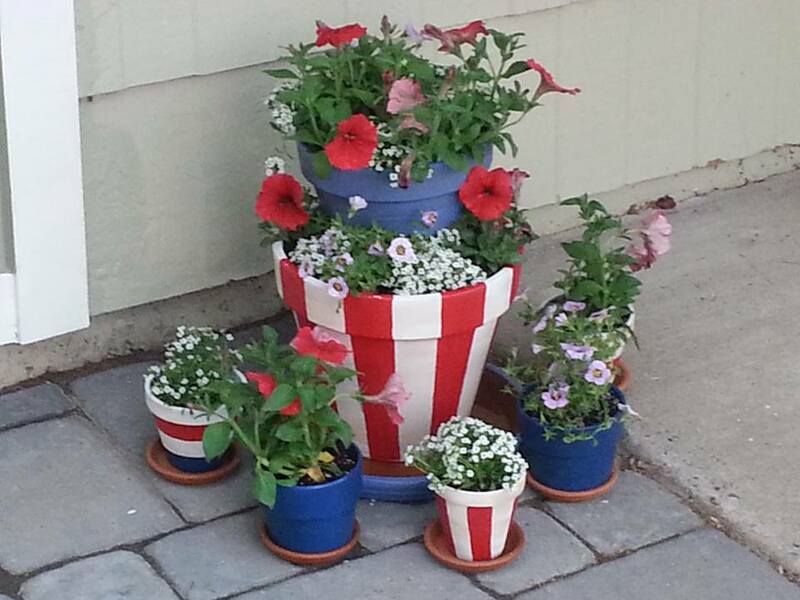 Recently I started decorating for the summer patriotic holidays. 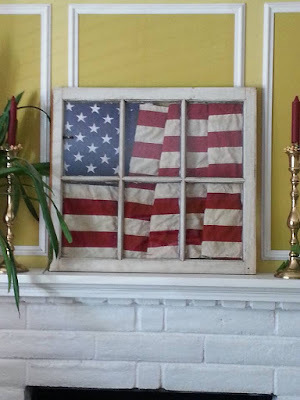 I saw this idea on Pinterest, so I can't take credit, but I purchased a cotton flag and coffee dyed it; then I put it behind my "new" window on the fireplace mantle. 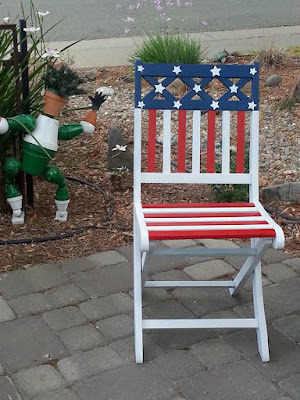 Here are a few of my other recent patriotic projects--most copied from or inspired by Pinterest; in fact, you can access my Pinterest boards HERE to see what's inspiring me. And yes, I'm still quilting. I finally finished appliqueing the border of my Country Houses quilt--it's what I worked on at the applique retreat I mentioned in my last post. I don't think I have a photo of it to share though. But it still needs to be quilted, so maybe I can share that next time I pop up with a post. Today is Father's Day and we have a couple of new fathers in our family to celebrate, so I'd better get off the computer and get the festivities under way. 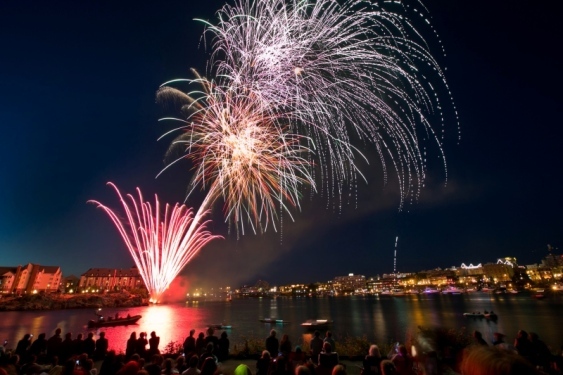 It's also the first day of summer--happy summer everyone! I'll try to be better and tell you about it after we get home--maybe share some photos too! I hope you're all doing well. We'll need to settle in for a longer visit soon. Happy stitching! I see it's been a few months since I posted. A friend recently mentioned my blog and so I thought I should check in to see where I'd left off. Yes, there have been more changes in my life - because that's how life is, right? In December I quit CrossFit because there were only two of us left in our class group and the trainer seemed less interested in training us. I really enjoyed CrossFit, but at that point, I decided maybe I could better use that money doing something different. So in late December, I came across Kaia Fit--kind of like a CrossFit or boot camp exercise program for women but with a diet and nutrition component and a lot of support via several Facebook groups both public and private. The first session, a six-week session beginning on the first Monday in January, was called BRIK and we were to work out on Monday, Tuesday, and Thursday evenings, with a flow/yoga session on Friday evenings, and an hour long walk/run at the crack of dawn (7 a.m.) on Saturdays. The second or third evening of the program, I strained my Achilles tendon doing sprints as part of a beginning physical assessment, and I've been wearing a walking boot ever since. ARGH! Needless to say, I haven't been able to participate in Kaia Fit this session, but I think it's a really good program, so I'd like to try it again one of these days--I just need to remember that I don't have the body of a 25 year old anymore so I need to be a little easier on myself. The Wild Child is getting ready to move to Portland. She, baby Roman, and I took a few days to travel there to look into renting a place for her little family, but without jobs in place for her and her significant other, we weren't able to find anything. But we were able to get more familiar with the city, take a look at possible areas for them, and look into the public transit system. The plan now is that we will keep the Drooling Dog for them for a few months while they move into some type of residential hotel in the Portland area and look for work. The Wild Child's ultimate career path will hopefully take her into publishing, but for now, she'll probably keep waitressing and/or bartending, an occupation that put her through college and one where she can work evenings while her significant other works days--or vice versa. Little Roman, who is not quite so little, is now over three months old and is a sweet little guy. 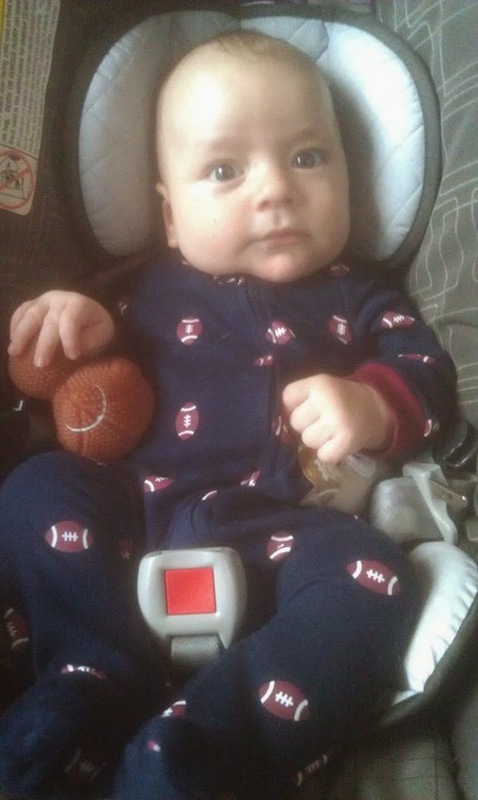 As you can see here, he's all dressed up and ready for Superbowl Sunday. In early January, Soccer Son and his Lovely Wife had a baby girl, Mia, so now we are the proud grandparents of two new babies! We haven't had a chance to get to know Miss Mia very well yet as Hubby had a nasty stomach bug during the first few weeks and we wanted to make sure we weren't going to pass anything on to this precious little girl. She's a real cutie, though! On the quilting front, I've mostly been working on a few different small projects, along with the larger Grandma's Kitchen applique quilt I talked about before. Next weekend is a baby shower for my best friend's daughter, and I'm working on something for her too. Oh, and I made a baby quilt for little Mia, but I haven't downloaded photos from my camera for awhile--I'll share a photo when I do. I saw someone posted on Facebook that they had taken down the last of their Christmas decorations--I sure wish I could say the same! This has been such a busy month, I still have a few things left to pack away. All of the trees are down and most of the Santas and such, but I've barely touched any of the decorative plates and odds and ends in the kitchen, so that remains to be done, and I have no idea when I'll find time to get to that. What are you doing for Superbowl Sunday? I don't have any particular interest in either team, but I'll probably turn the game on while I work on the baby quilt--at least the commercials are usually pretty entertaining! Whatever you spend the remainder of the weekend doing, I wish you joy! A Little Update . . . I've been away for the last week, spending time with the Wild Child in Eureka as she gave birth to my first grandchild, little Roman. Or not so little, actually--8 pounds 4 ounces. I made the almost 6 hour drive to Eureka, thinking all the way that I would be too late to witness his birth, but I needn't have worried at all because I was there in the birthing room for 25 hours before that happened! Poor Wild Child, it was a long, hard labor and delivery, but the doctors, midwives, and nurses were terrific and everyone was fine in the end. 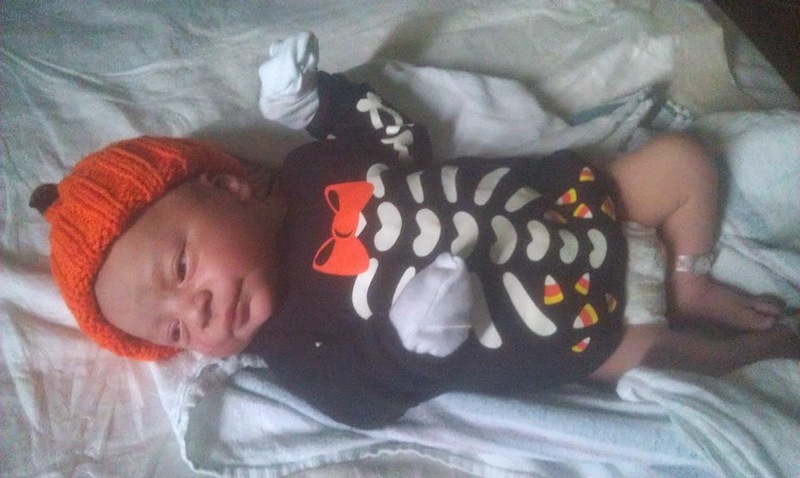 So Roman arrived on October 30th, just before 8 p.m., and he was dressed up in his first Halloween costume the next day. Due to one thing and another, I haven't managed to do very much quilting, but while I was gone, I did manage to get the binding on a Halloween quilt . . . just a couple days after Halloween! I'll take a photo and show you just as soon as I have a chance. In the meantime, I can share with you two of the Country Homecoming quilts--unlike me, these ladies have been able to get their borders done, and I know you'll enjoy seeing them. It's so pretty it makes me doubly anxious to get going on mine! 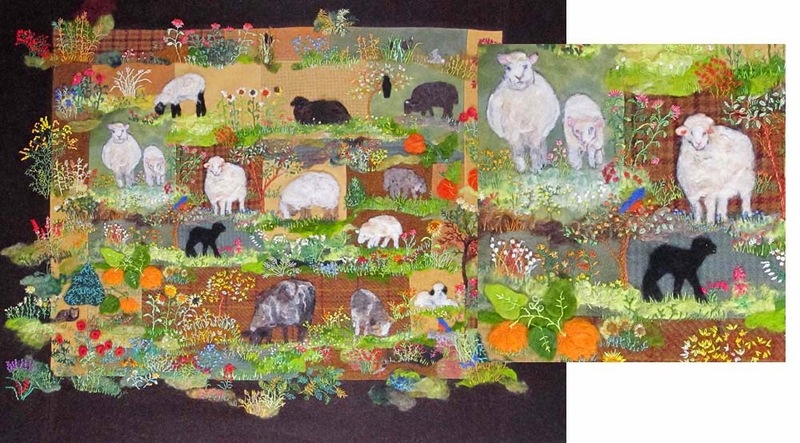 And I know you'll enjoy Nancie Anne's quilt top too. Just click on her name and it will take you to her blog post. I never did get photos of my Halloween decorations to share this year, and now it's time to take them down. But I'll leave the fall decorations in place for another few weeks, and maybe I can get a photo or two to post soon. Thanks for stopping by! 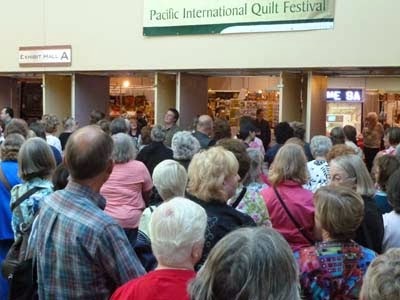 I'm taking the day off work tomorrow and heading out in the morning for a couple hour drive to Santa Clara, where I'll be taking a class at the Pacific International Quilt Festival. Will you be going to the show this weekend, by any chance? It's been several years since I've been to this one put on by Mancuso, and it's huge, with classes each day, tons of eye candy in the form of quilts, and a whole lot of vendors. The last time I went to this show, I took an applique class and the only chance I had to visit the main rooms was spent zooming around to the various vendors, looking for materials for the class during our lunch break with almost no time to admire the quilts. I think, if I remember correctly, our class was a two-day class, too, and we were filmed for Simply Quilts--I think this was near the end of Alex Anderson's TV series. I've been told I show up in the episode, although I've never seen it! Oh, yeah, and there's embroidery involved too--it looks like quite a bit, right? I've never done needle felting and always wanted to try it, so this is my chance to learn. If you'd like to see a little more of this process and the thought behind it, check out Debora Konchinsky's blog--she's the instructor. Just click HERE. I've booked myself a room and I'm looking forward to an early evening spent in solitary splendor, with a good book, a stitchery project to work on if I feel like it, and a new pair of jammies. On Saturday, I'll head back to the show and hopefully I'll get to spend more time viewing the quilts than I did the last time I went. And, of course, I'll take a little time to check out the vendors--after all, I'll have all day before I hop back in the car and head home. Maybe I'll see you? 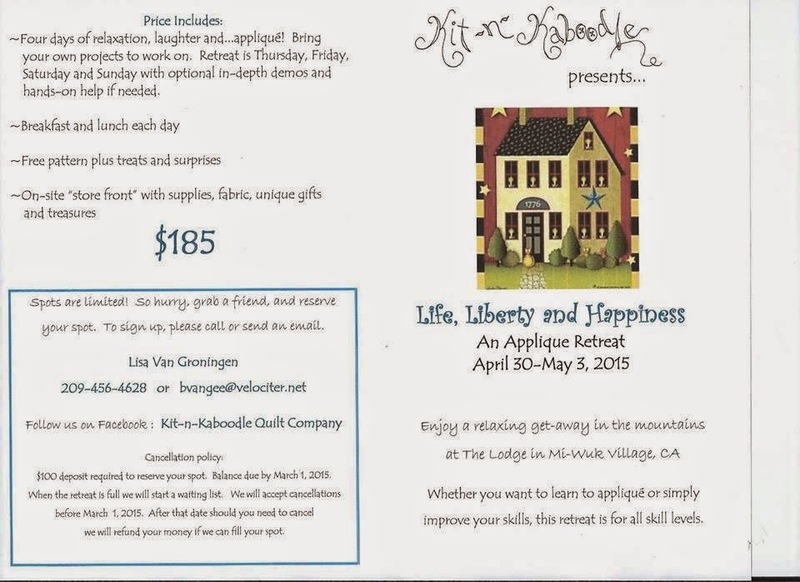 I'm a quilter living in Northern California. 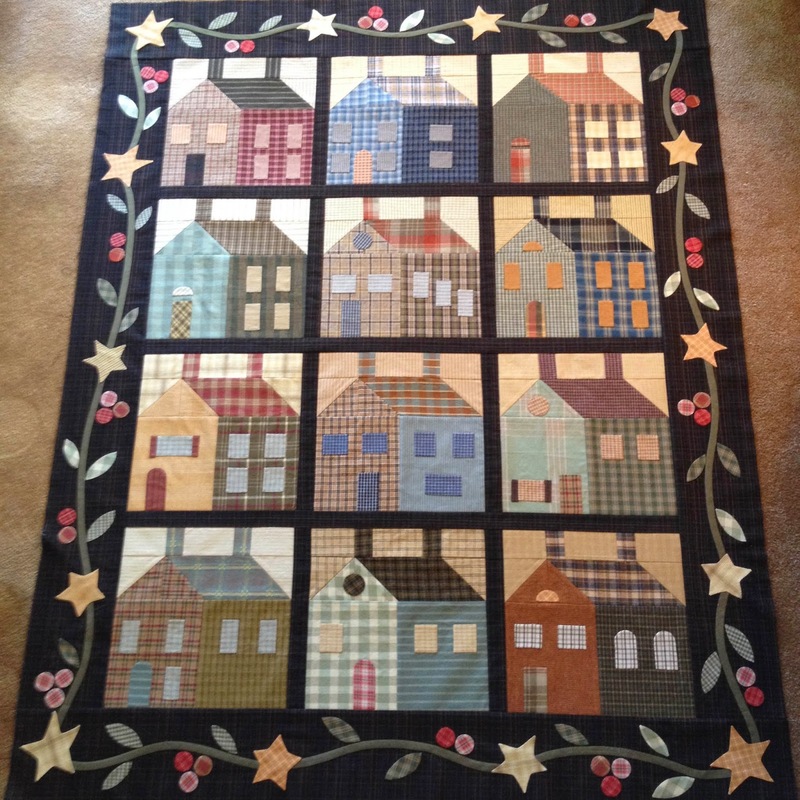 I sew and design quilts. During the day, I'm a legal secretary, but at night, I can usually be found in the Sweat Shop, engaged in the sport of X-treme quilting! I'm married and have two adult kids, Soccer Son and the Wild Child. I have a daughter-in-law, the Lovely Wife, and an almost son-in-law (whose blog name is yet to be determined). AND both of my children have blessed me with darling grandchildren recently, a boy and a girl. I try not to take myself too seriously and often write tongue-in-cheek--if you think I might be joking, I probably am! And now, some of my patterns . . .
Where you'll find my original patterns and more! It's 2013. YIKES! It's 2014! And what's my plan for the year? More of the same? Let's see what I said last year: "Before 2012 ended, several ongoing projects were set aside. Okay, who am I kidding? I'm sure I could say the same thing for every year since 2000! So, in 2013, I'm going to try to get back to many of the 2012 projects and some that were begun even earlier, and get them done. I'll keep track of my progress, in words and photos, here in my side bar." 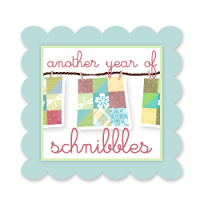 Yep, one year wasn't enough--I think we'll roll it on into 2014! Some of the posted tutorials span more than one post. When you open the link, the newest post will appear first. Scan down to make sure you begin with the first post, which will appear last.